Our primary focus is collecting and processing large amounts of street-level panoramic data. 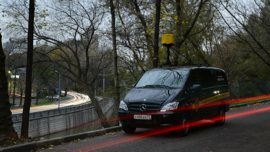 Since 2008 our company has been collecting street-level panoramic data of roads and streets in Russia and other countries. We collect panoramic data with our own equipment and software. Since 2014 our equipment delivers panoramas with resolution 120 Megapixels per each shot that is the best resolution for this type of equipment. Yandex.Maps service (which is twice as popular than Google in Russia) is based on data collected by us. It covers all major cities in Russia, Ukraine, Belarus, Kazakhstan and Turkey. We collect tens of thousands of kilometers of roads and streets, process millions of panoramas and get amazing results every year. We have collected more than 180 thousand kilometers and more than 3 million panoramas in 282 cities in 5 countries for now. Send Please, fill in all the fields.